Where do I buy all that stuff? Hard to believe, but it’s been over a year since I started this little experiment. (now Dec 2012, was Sept 2011) I got lazy, frankly, and just didn’t update my report. But here is my synopsis, finally! In an attempt to be even more scientific, I actually kept track of the mileage I got out of each of the sets of tires. Remember, though, this is a sample of one of each (well, two if you count both the front and back tires), and it was a very uncontrolled environment. (i.e. who knows when the next thorn or nail is out to get you! You may ride for months without a thorn, then get 3 or 4 in the next 3 or 4 rides. You can’t generally blame that on the tire! ), So, the results are not completely conclusive. Still, however, I think I have learned enough to effectively tell general characteristics about how each tire wears and holds up to thorns and other sharp objects. As mentioned in Part 1, these are the most popular high-end tires in my area (Tucson, AZ), and were strongly recommended by a couple of my friends. Therefore they were the first pair I tried when I upgraded from my “standard grade” tires. I’ll have to admit, I did notice a difference – they felt smoother and faster than my regular tires. It wasn’t a huge difference, but it was noticeable. (If you go back to the first two parts of this series you’ll note that I changed from 700 x 23mm to 700 x 25mm, and I also went from butyl tubes to latex tubes. So, it’s possible that either one of these changes was really responsible for the improved ride quality.) Of the 3 brands and models tested, the Continentals lasted the longest – 1764 miles – before I felt like it was time to dispose of them. (Generally when tires get thin you start getting repeated flats, so you know it’s time to get a new set!) Overall I was very impressed with these tires, and had to accept an “I told you so” from my friends, accordingly! As for durability, I could tell right away that they weren’t going to match the Continentals, since they were made of a lighter, thinner material. (The Vittorias are 320 threads per inch, vs three layers of 110 threads per inch in the Continentals. This is why they feel so “plush” – it’s like better sheets on your bed. The higher the tpi, the plusher they feel. But also the more quickly they wear and become susceptible to thorns. …Despite all of that, they lasted rather well, turning in the second-highest mileage before I felt they were “done” – 1467 miles. Overall I was also very impressed with these tires – they weren’t as durable as the Continentals, but they didn’t claim to be, either. And they were very slightly quicker and smoother. 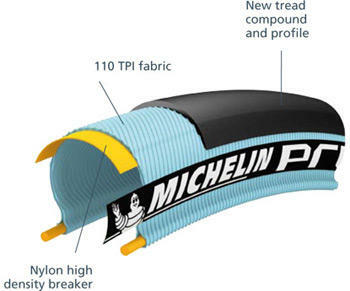 In at least a couple reviews I read while researching tires, they picked the Michelin Pro3 Race as their favorite all-around tire, due to its overall ride quality, excellent wear and ultra-low rolling resistance. Therefore I had to include them in my little test. Unfortunately, however, before I could buy a pair, Michelin replaced these with a new model, the Pro4, which came in both an “Endurance” and a “Service Course” model. Since my goal was for ultimate ride quality and minimum rolling resistance, I went with the higher-performance but less-endurance Service Course model. (I would later regret that choice, as you’ll see below) Michelin claimed that the Pro4 was pretty much better in every way than the Pro3, so I figured I couldn’t go wrong. Overall these tires were built more like the Vittorias than the Continentals – i.e. they were thin and light – so I knew they probably wouldn’t be very good in the endurance department. But when I rode them, they didn’t seem as good as either of the other tires in ride quality or rolling resistance. (Again, these are very subtle differences.) So I wasn’t extremely impressed from the get-go. But when they started getting flats very early into their life, I decided I didn’t like them at all! They turned in the lowest mileage of the three tires by far – 609 miles – before I disgustedly threw them away and put a new set of Continentals back on the bike! As I mentioned, I continued to use the Vittoria latex tubes during all of these tests, primarily because several articles had convinced me that latex tubes were longer-lasting, since they were more flexible and therefore more resistant to thorns. They were also claimed to give you lower rolling resistance, although I’m not sure how a tube can affect rolling resistance! (Beware of snake oil claims!) Their main drawback is cost – you can’t find in most shops, so I ordered them online, to the tune of around $13-15 each tube! That’s double or triple what you’ll pay for a good butyl tube! But to me it’s worth it if they really do offer more resistance to flats! So, the overall conclusion I finally came to, after finally figuring out what kept happening, is that latex tubes are NOT the way to go! Just buy good quality butyl tubes from your local bike shop and you’ll be better off! 2) Rotate your bike tires, just like your car tires. Most of the weight – and therefore the wear – will be on your back tire. So, to get maximum life out of your tire, rotate them at least once during their life – somewhere around 750-1000 miles. If I would have learned this little trick earlier on, I’m convinced I could have stretched another 200-500 miles out of each of the sets! So, in conclusion I would say that my friends were right – the Continental Grand Prix 4000s is the best overall, in terms of a comprise between light weight, cost, feel and endurance. They will be my go-to tire until something better comes out. 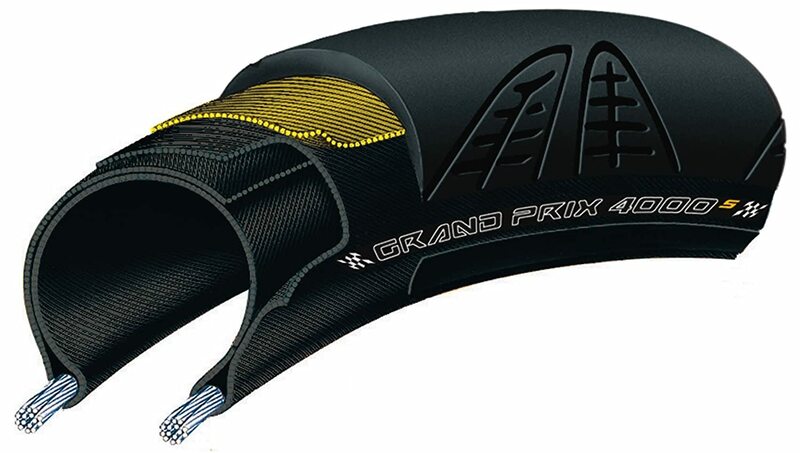 The Vittoria Open Corsa Evo 320 tire is probably a tad better riding than the GP4000s, but it’s only equal or worse in all other categories. (Note that it might perform better – i.e. last longer – with standard butyl tubes, so I might have to give them another try!) I would recommend the Vittorias for anyone who needs that last bit of performance and/or ride quality and is willing to sacrifice a tad of durability, as well as pay a tad more. …Finally, I would not recommend the Michelin Pro4 Service Course at all. They were very thin, didn’t ride that well, and didn’t last at all. Yuck! I hope this helps with your tire choices – there definitely is a difference in tires, and it definitely pays to buy good tires. Please let me know your experiences and/or recommendations! This entry was posted in Product Reviews, Thoughts of the Week, Tires and tubes by ctretschok. Bookmark the permalink.